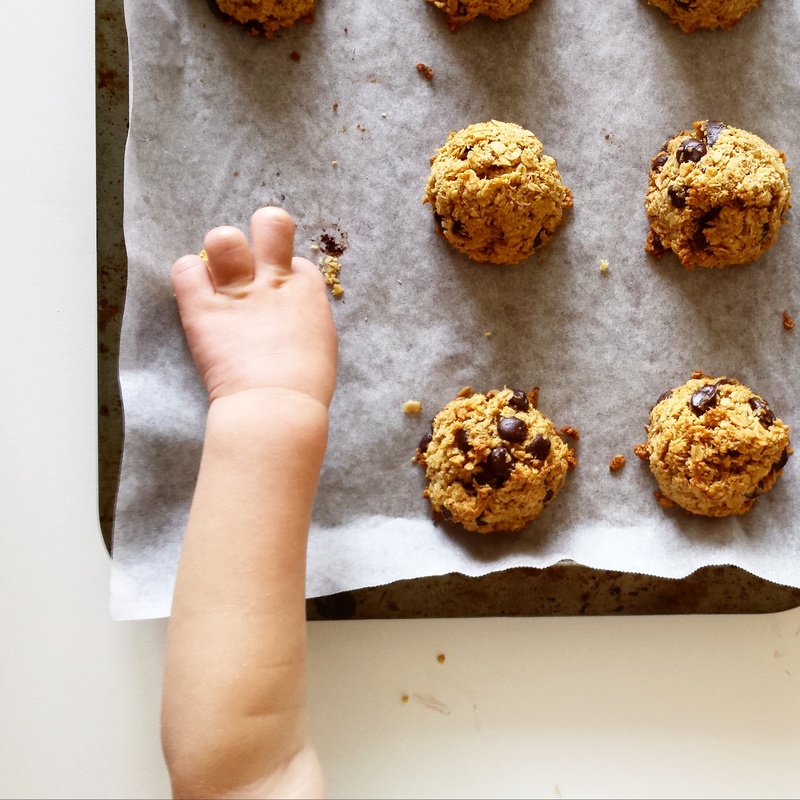 I want to blame my pregnancy cravings for my need to have freshly baked cookies within reach at all times, but I know this desire exists equally as much when I am not with child. The making, the baking, the dipping in the milk…it’s all a fantasy of the cookie process that is often lingering in the forefront of my mind. But as you know, one cannot snack on sugary, so-calorie-high-it’ll-make-you-hallucinate cookies all the time for the simple fact it’s not good for you (and one’s teeth might fall out). Good for your soul, yes. Good for your insulin levels and general health, maybe not. 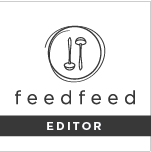 So, I’m always trawling for recipes that allow me to bend the rules about just how many cookies I can ingest before I head steadily into a sugar coma. And of course, I’m always conscious about the nutrition side of things. Well, ladies and gents, these are my perfect little morsels of heaven. I’m truly not a fan of the super-sweet cookie, preferring a much more substantial kind, one that could double as an afternoon snack with a glass of milk, and keep me going ’til dinner. 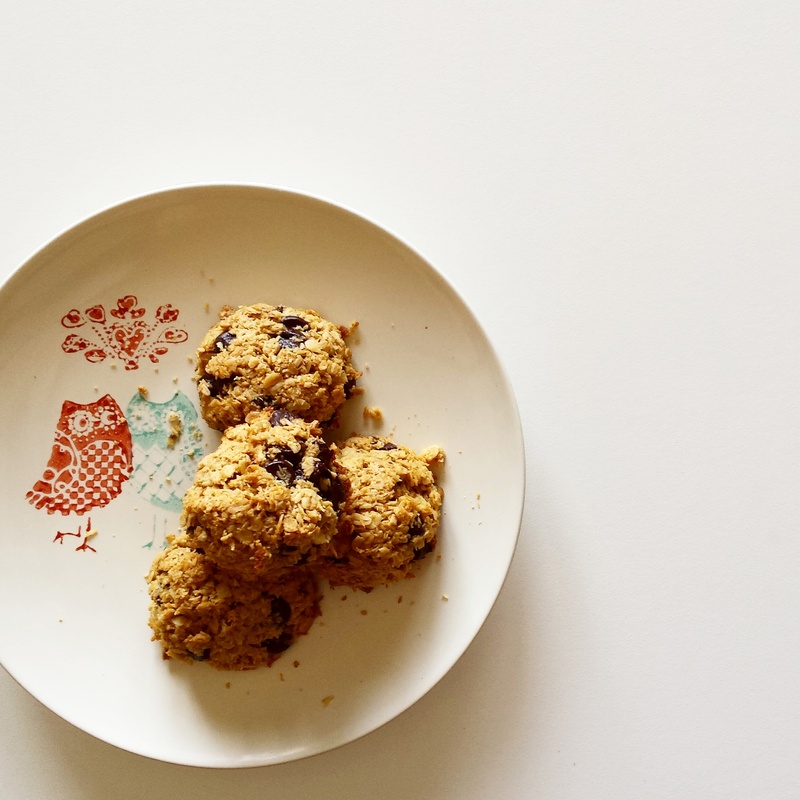 These oat cookies are sweet enough to satisfy your cravings, yet wholesome enough and not likely to spike your sugar levels. Oh, and you don’t even need stirring utensils! All you need is the one bowl and your two hands. I’ve amended the recipe from The Healthy Chef, simply to suit my own tastes and because I can’t leave well enough alone. I’m certain you’ll love these, especially when dunked into a tall glass of milk. 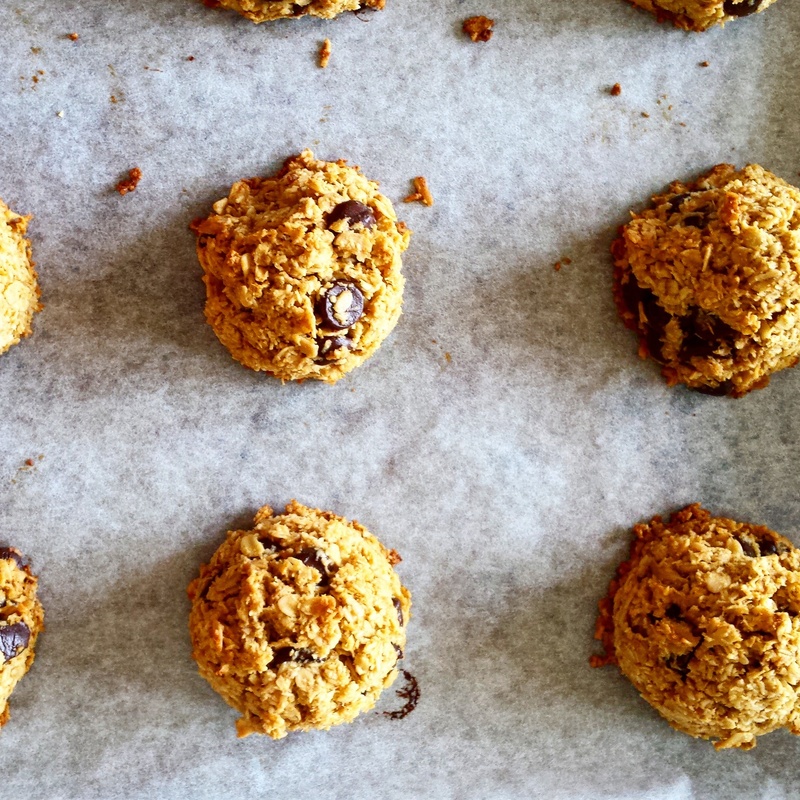 If you prefer a more chewy cookie, decrease the sugar to 1/3 cup, although they’ll be slightly less sweet of course. I often make them with the lesser amount of sugar during the week for the kids and make a cheeky batch for the hubby and I with that just touch more sugar. We deserve it. Preheat oven to 150C and line a baking tray with baking paper. Combine all ingredients except the choc chips, mixing and squishing with your hands until the oats start to stick together. Let mixture rest for a few minutes to allow oats to soften. Add in the choc chips and mix through. Using an ice-cream or cookie scoop (or simply your hands) form into little mounds and place on the tray. You should have around 11 or 12. I use this OXO Cookie Scoop – it’s a lifesaver. Bake for 20 minutes or until golden brown, checking half way through. Allow to cool on the tray. Serve with a tall glass of milk, at any time of the day you see fit.